Great guy who is very deserving of this recognition. I am pleased to have known Narine Dat Sookram. We need more like him. Agree with you Enoch! I am glad you felt the same way. Such an inspiring person, I myself is very fortunate to have him as a friend and someone to look up to. Hello Narine, glad to see you are one of the finalists. I am confident you will be one of the winners. All the best. We are cheering for you. Wow! No surprize to see you here Mr. Narine Dat Sookram. You have done so much to bring people together and I am sure this will motivate you to continue what you were meant to do. Congratulations! Narine, you have done so much for so many people within looking back for anything in return. My friend congratulations and we will continue to support our vision for peace, because you do it best. Narine, peace will not be positive without people like you. You are deserving to b among the other nominees. Promoting peace takes time and patience, but there are people out there with those kinds of patience. Narine is such of a person. The fact that I know you Narine, makes it very special to see you as a finalist. You are a winner in my eyes. You always do things for people to whom you don’t even know. You are a true hero, because after all you are a peacemaker. Narine I’m also very happy and pleased of the great Job you are doing in your Community. 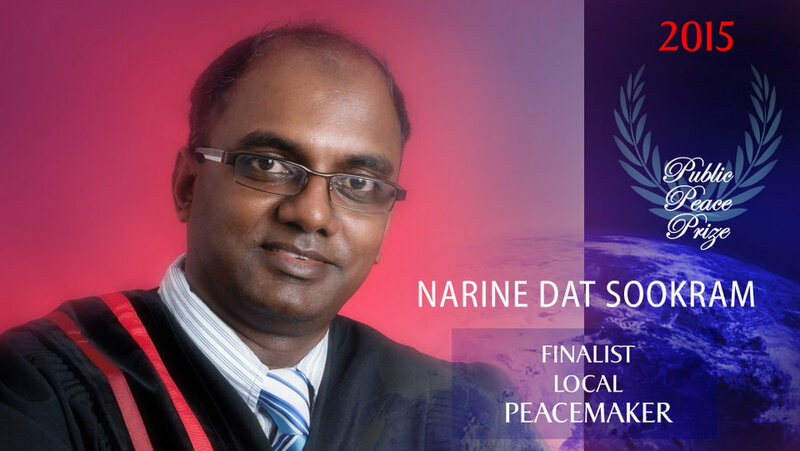 I am happy to read to have voted for you Narine, regardless of the outcome you are still a winner. Gook luck! Narine, you are proven yourself time and time again that you are a peacemaker. I wish you nothing but the best. All the best! Goo luck Narine, all the best. Continue the work you are doing. I am so proud to know you Mr. Narine Dat Sookram. You are a true role model and I am happy to come to know of your work. You are a good example of an everyday peacemaker. All the best! As an immigrant to Canada myself, I know the loneliness and difficulties associated with coming to a new country. English is my first language, but when I applied to attend college 33 years ago, I was extremely nervous! I now volunteer with YMCA Immigrant Settlement Services and recognize the need, expense and frustration newcomers face when having their credentials evaluated.